In the past two weeks we saw very high armyworm populations in rice. Many fields had to be treated. However, the pyrethroids, common insecticides used against armyworms, did not provide good control. Applications of carbaryl did not reduce populations either. Most likely, these products failed to provide good control because of the very high populations. In an average year, when an insecticide treatment is needed, the number of armyworms in the field is much lower than this year, and therefore control is much easier to achieve. Achieving good control with an insecticide application under very high population pressure is difficult, even with effective insecticides. Another factor that contributed to the lack of control this year is the size of the worms. As with most moth larvae, the smaller the worm, the easier it is to kill it. However, targeting small worms in rice can be challenging. 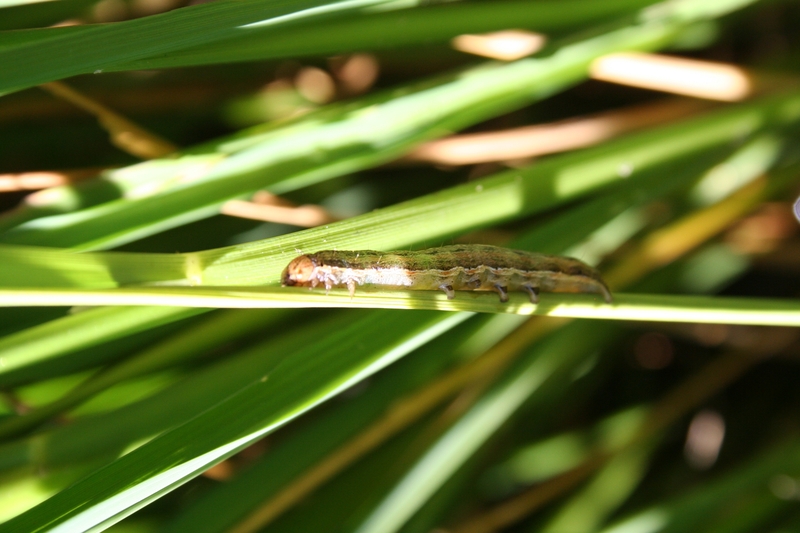 After hatching, armyworms go through six instars, or stages, before pupating and turning into moths. Each stage occurs when the worms outgrow their skin, and need to molt so that growth can continue. The first two instars stay hidden in leaf sheaths or inside furled leaves, where they feed. These worms are really small, eat little and are hard to find. The third instars start feeding on leaf blades, but the amount of tissue they consume is small and the injury difficult to notice (see Table 1 below). It is during the last two instars, fifth and sixth, when armyworms consume the most foliage. Usually this is when the injury and worms are noticeable. Unfortunately, these worms are the hardest to kill. At 70o F, it takes 13 days from hatching for worms to reach the fifth instar. With the warm weather experienced in the past weeks (average daily temperature for the last two weeks of June was 75o F in Willows), armyworm development must have occurred somewhat faster. Infestations probably started in the early part of June and went unnoticed until the worms reached a large size. Fifth or sixth instar armyworm feeding on rice leaf. Populations are now dwindling. In most areas worm density is decreasing or have disappeared all together. A second infestation might occur sometime around the boot and heading stages. The second infestation does not originate from the one we just experienced. Armyworms pupate in the soil, but in rice fields, when they drop to find a suitable place to pupate, they drown. This means that the worms seen earlier do not produce the moths that will lay eggs in rice later in the season. Nevertheless, we might see another severe outbreak if the conditions that favored the previous outbreak continue. Growers and PCAs should remain vigilant and try to identify infestations early to avoid direct panicle injury, which can occur during the armyworm second infestation.